For years, the gold standard for correcting oral issues like misalignment, crookedness, gaps and crowding has been metal braces. You’re wondering what the secret is to how they work, though. As you read on, your orthodontist in McMurray explains how the different parts work together and why this method is so effective for fixing your bite abnormalities and delivering the perfect smile. Brackets – First, brackets are bonded to your teeth. These are essential to the process because they hold the arch wires that provide that add the tension to your teeth and cause them to move. Bands – Orthodontic bands are cemented to the teeth using a dental bonding agent and wrap around each tooth to act as an anchor for the brackets. This application isn’t used in all cases, though. Arch Wires – The wires provide the needed tension to encourage your teeth to move. As the process goes along, your dentist will tighten them to accommodate your improving bite. The Buccal Tube – This fits on the band of the last tooth and holds the wire in place. Ligatures – The ligatures are elastic rubber bands that may be used in some cases to also help keep the wires attached to the brackets. Together, these components work to deliver a perfect smile, but how long does the process take? You may be wondering how long the process takes to correct your smile, but that’s impossible to answer until you’ve visited your dentist for a consultation. While there, the professional will assess your needs and establish the protocols for your treatment process. In general, though, patients wear braces between 6 and 30 months. Avoid Certain Foods – You should avoid eating foods that are sticky or hard (like chips) because they can damage your brackets or break your wires. Oral Hygiene – For your oral hygiene, you’ll need to get a waterpik to replace the traditional method of flossing. Additionally, you should be careful when brushing your teeth, so that you don’t damage your wires or brackets. 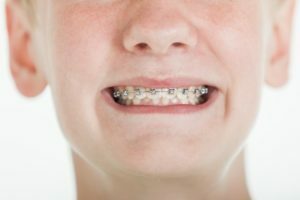 Discomfort – When your braces in McMurray are first placed, you may experience some slight discomfort from the tension applied. Don’t worry, though, because you’ll soon get used to having the apparatus in your mouth, and as your teeth adjust, the discomfort will subside. While there have been countless innovations in the world of dentistry, the traditional braces method is still considered as the best method for correcting even the most complex bite issues. So to get the process started for correcting your teeth and getting the smile of your dreams, reach out to your local orthodontist to schedule a visit today! Dr. Gary Cartwright earned his DMD degree from the University of Pittsburgh and has since gone on to practice orthodontics for over two decades. Additionally, he is a member of the American Association Orthodontists and a Diplomate of the American Board of Orthodontics. Dr. Cartwright can be reached for more information through his website.